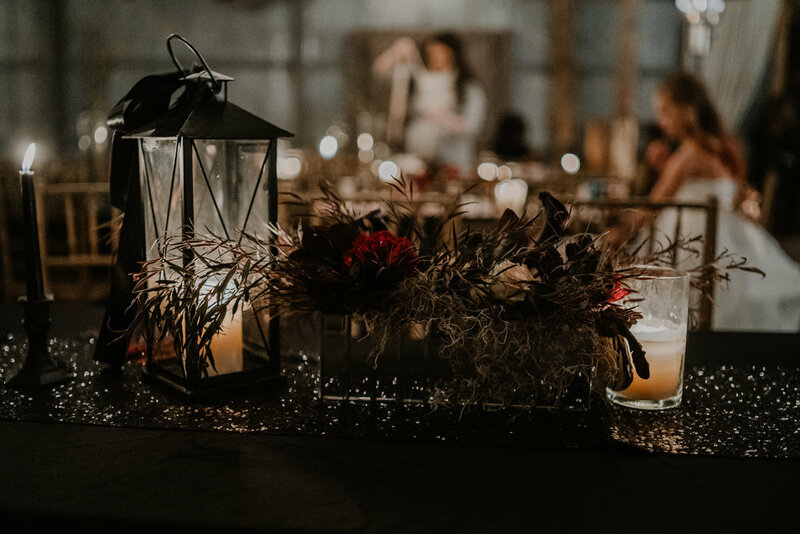 Bohemian florals, rustic details, a romantic indoor ceremony… We’re thrilled to share Jennifer and Nick’s fall wedding today, with all its bohemian-rustic goodness! 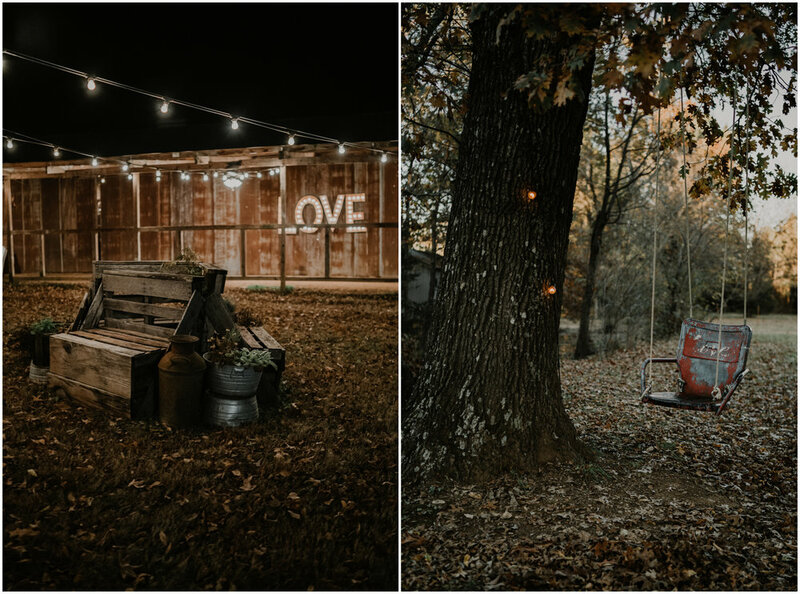 We’re also a tiny bit sad, because this is the very last of our fall 2018 weddings, but that also means that our gorgeous spring 2019 weddings are just around the corner! Each detail at this wedding was planned to perfection - floral details, ceremony and reception details, their dinner menu, their favors, their first dances… EVERY detail was so well thought out. It’s so special when couples put effort into making every detail meaningful; it’s as if tiny pieces of their entire love story are surrounding them everywhere they look on the biggest day of their lives. Jennifer and Nick were married at The Barn at Twin Oaks Ranch on October 13, 2018. They chose a warm fall color palette of burgundy, navy and gold - and it was the fall color palette of our dreams! 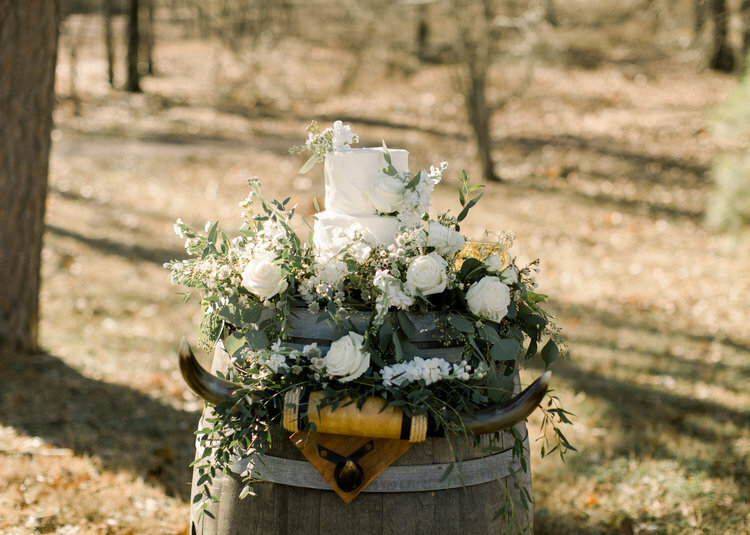 Their details were equally bohemian and rustic, with boho florals, burlap, a cowhide, steer heads and gold accents. Jenn’s bridal gown, from Danielle’s Bridal, was feminine, classic and stunning. We loved this silhouette and neckline on her, and the lace detailing was beautiful. 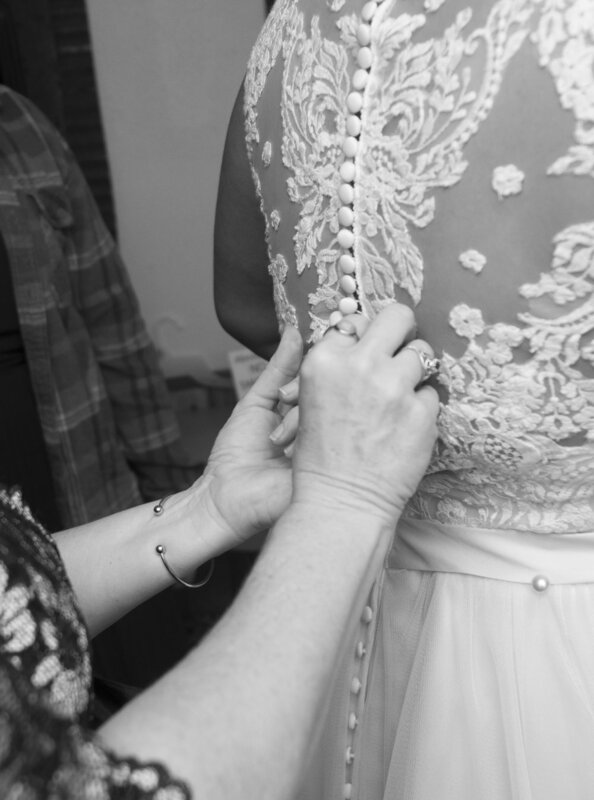 The back was so gorgeous… my favorite detail for sure! Jenn, you are the loveliest bride ever! You were absolutely glowing. Can’t you feel the joy and excitement in these photos of Jenn and Nick?! Their happiness is contagious! This bridal party was just the prettiest! The bridesmaids wore long burgundy dresses with different necklines (from Azazie), and the guys kept it semi-casual in jeans, tan jackets and boots. Their attire fit the wedding’s theme and color palette perfectly! 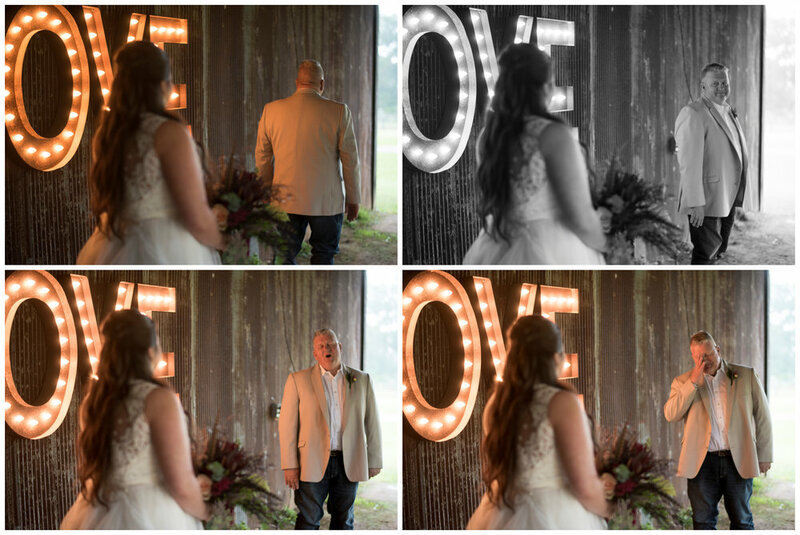 Jenn and her dad’s first look was the absolute SWEETEST ever. These photos will melt your heart, y’all. And just wait until you see the father-daughter dance they shared at the reception later on! Jenn’s florals and bouquets were unique and absolutely stunning. They were full of rich shades of red, a few pops of light pink, vibrant greenery, and some really unique additions that we were crazy about. “Being the avid outdoor enthusiasts we are, one of the first things Nick and I agreed on was the use of turkey and pheasant feathers,” Jenn said. “We wanted them in all flower arrangements and boutonnieres.” We absolutely love it when couples include details that are special to them - the feathers used throughout their florals made them totally unique to this wedding! Rainy weather pushed the ceremony inside The Barn, which only made it that much more beautiful and romantic. “The last minute storm really surprised everyone, but Lesleigh and her team made the best of the situation,” Jenn said. 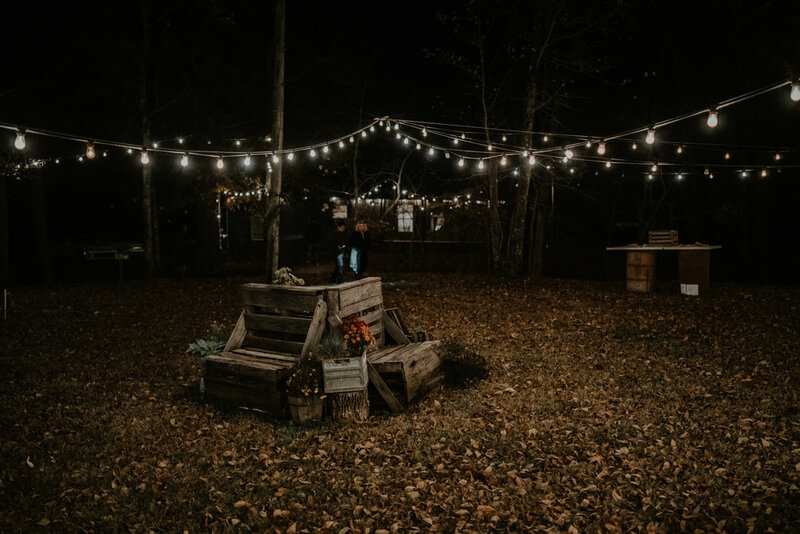 The Barn was already all set up for their reception, so most of their guests sat at the reception tables, and we made a small ceremony area for seating for their close family. They tied the knot in front of a boho-rustic altar - with a burlap drape, steer heads and more of those gorgeous florals - while standing on a cowhide that was a wedding gift from Jenn’s parents. Jenn and Nick’s ceremony was so special, and these photos of Nick seeing his bride for the first time melt our hearts! This sweet moment right after tying the knot… giving us ALL the feels. Jenn and Nick’s reception was stunning, unique and super detailed. Jenn said the feathers used throughout the florals, “along with cow skulls, lanterns, and gold accent pieces made our reception into the rustic dream I've always pictured.” Their tables included navy tablecloths, burgundy and burlap runners, gold lanterns, gold jars and other vases, geometric gold vases, and the most gorgeous fall florals. Their place settings included burgundy and navy napkins, and vintage glassware in their wedding colors. This couple thought of EVERYTHING, so the amazing, super thought out details kept coming! They sent their guests home with custom koozie favors from Sip Hip Hooray. One side read “Nick and Jen 10.13.2018” and the other said “Cheers to the firefighter and his flame.” We LOVED these! 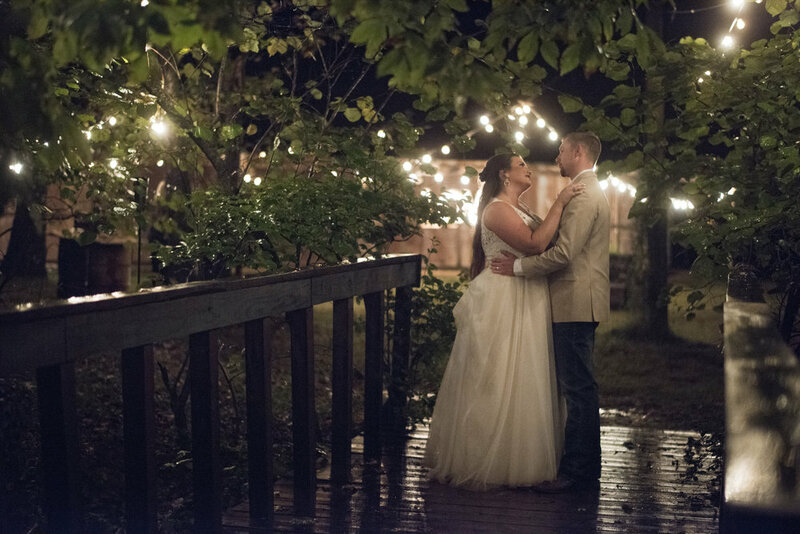 My favorite photos of the newlyweds were these from the end of the evening underneath all the gorgeous twinkly lights outside The Barn. These are SO dreamy and romantic and an absolute fairytale. Kingfisher. It’s a little town in western Oklahoma with roughly 5,000 people, and although we’ve never been there, it’s a place that we’ve grown to love. Fourteen people from that tiny town have traveled all the way to our little corner of Arkansas to tie the knot at The Barn. And they just keep on coming! We’re not complaining at all… we LOVE our Kingfisher couples and all the western, ranch style, rustic charm they’ve brought to our venue. We’ve asked ourselves countless times why so many people from a town five hours away have driven all those miles to get married at our venue, and here’s what we’ve come to understand: word of mouth advertising is the BEST. We’ve never once ran an ad in Kingfisher’s newspaper (although we’ve joked about it) or advertised in that area in any way. Apparently our Kingfisher couples love us, because they and their families keep recommending us to their friends, cousins, sorority sisters, and other acquaintances and sending them our way! We’re so thankful for that, and can I just say how proud I am of The Barn’s reputation?! I may be biased, but The Barn is really something special, and this is proof. 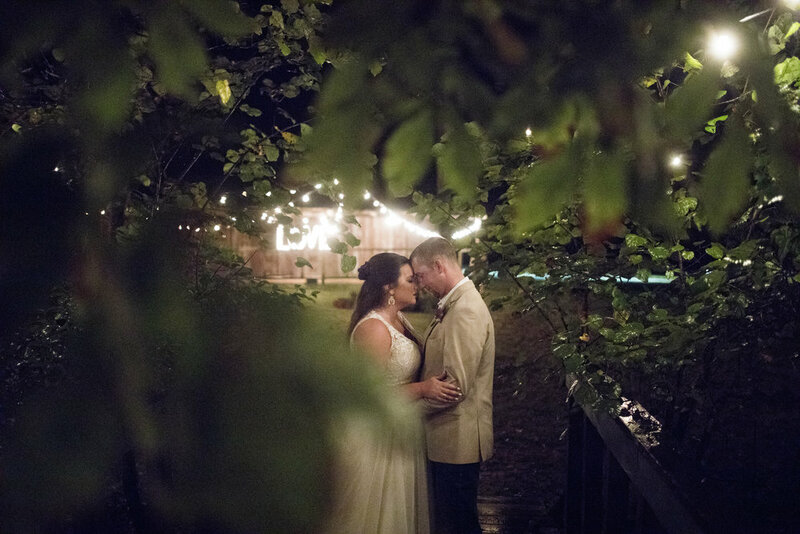 Almost two years after our first Kingfisher wedding, Stacy and Aaron tied the knot at The Barn. Their wedding was so romantic and intimate. They chose a color palette of mauve, burgundy, gray and ivory, and their details were romantic and elegant. They got married in front of The Barn, and it was just the prettiest day ever. We loved their purple florals, their beautiful ceremony, and their dreamy reception - especially the stunning garlands on their tables! A month after Stacy and Aaron’s wedding, Stacy’s cousin Nikki and her husband Mac made the trip to The Barn for their elopement! 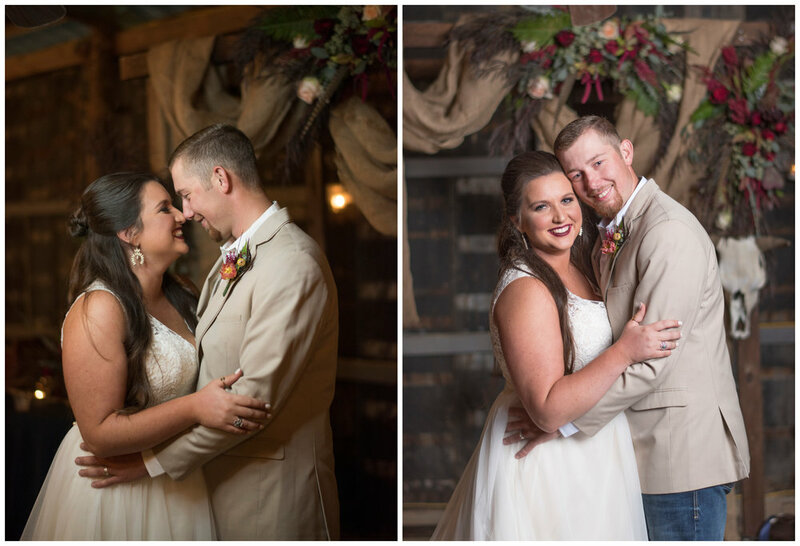 They had first heard about The Barn way back when Morgan and Wager were married here, and they knew it was where they wanted to tie the knot as soon as they got engaged. What’s funny though is that Stacy and Nikki were both planning their weddings here without ever knowing about the other cousin’s upcoming wedding at The Barn! Nikki and Mac had the prettiest spring wedding, with touches of country, woodsy, vintage and rustic that fit them perfectly. Their altar was so pretty, and we also loved their cake display! 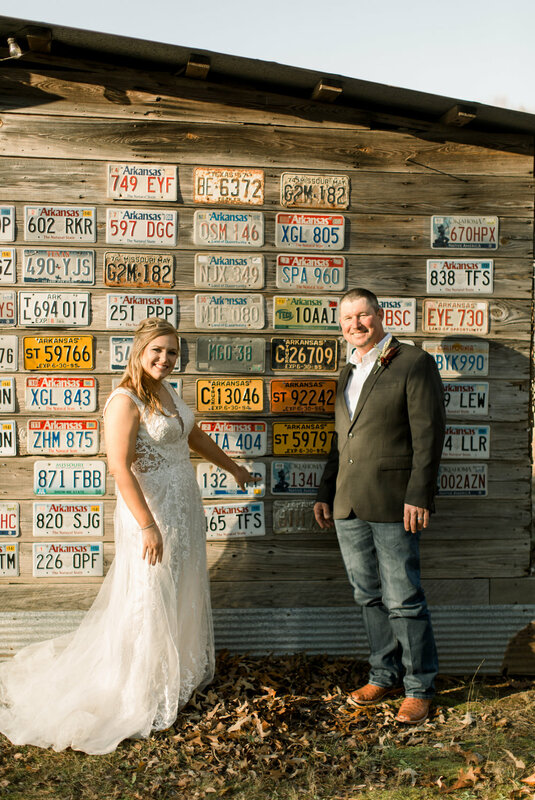 We loved every single detail from Morgan and Hadley’s western, ranch style wedding! They brought a little bit of the Wild West with them to The Barn, and it was truly a wedding after our own hearts! We’ll forever be in love with the amazing hand tooled leather wrap around Morgan’s bouquet that matched their cake (best details ever). 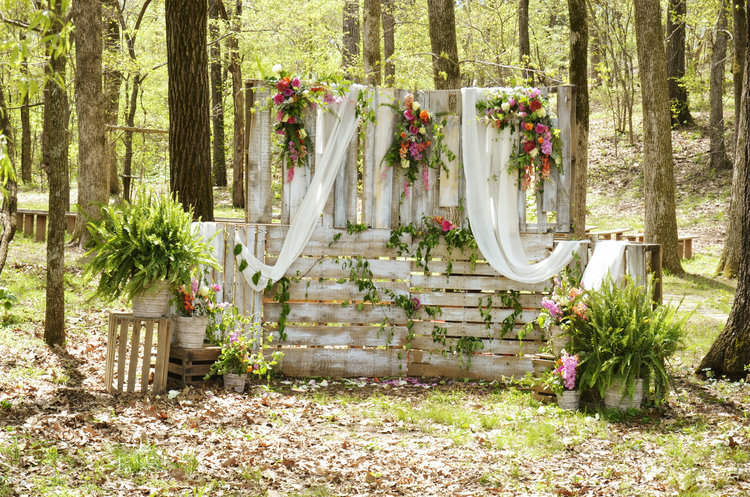 We adored their white washed pallet altar, their pretty pink florals, their monogrammed hay bale, and literally EVERYTHING. Y’all can’t miss a single detail from this one! Amanda and Jon were the first of three fall 2018 Kingfisher couples! 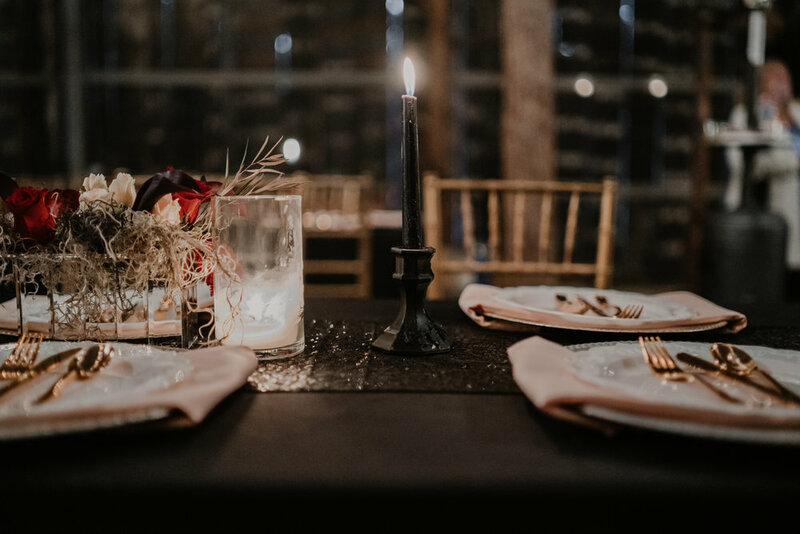 They chose the ultimate fall color palette - tan, burnt orange and sage green - and their details were rustic and so perfect for fall, with the prettiest fall florals, earthy details and wood accents throughout their decor. Their reception was absolutely stunning. They chose to have a full-on dinner party for their small guest list, so it was incredibly intimate and dreamy. And of course they included the Kingfisher cowhide in their ceremony decor! 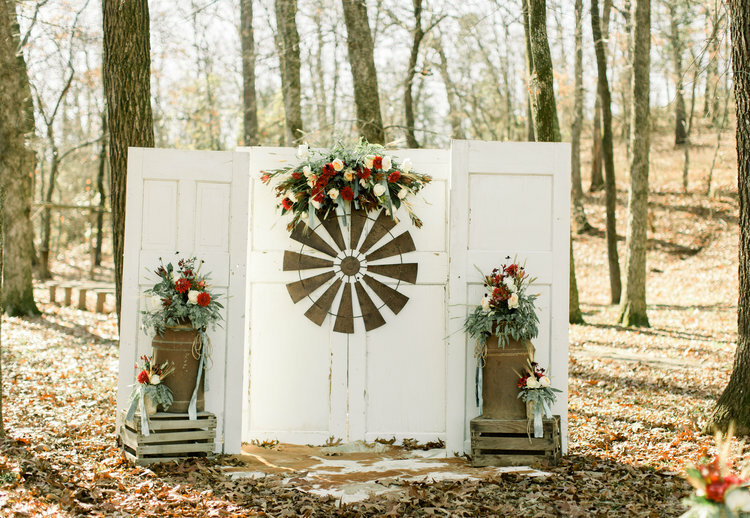 Our beloved windmill wedding… Erica and Matt’s fall wedding was just so pretty. Their colors were red, brown, turquoise and cream, and their details were rustic. We used windmills, lots of old rusty things, wheat and creamer cans throughout their decor, and it was one of my personal favorite weddings of the year. 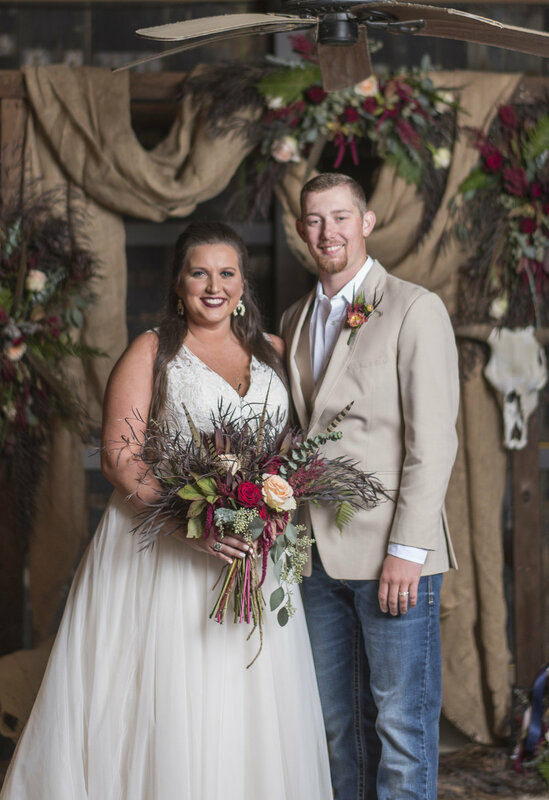 We LOVED everything about their ceremony… and yep, there it is, the Kingfisher cowhide! We loved their bold red florals. We loved their gorgeous cake display. And their portraits were some of the prettiest we’ve ever seen! Go check out their post and swoon over them all! The next weekend, Autumn and Tanner eloped at The Barn. Tanner is actually Matt’s son… as in Matt from the wedding the previous weekend! He and Autumn got ahold of us the Friday after Erica and Matt’s wedding, and we planned their wedding in just two days! It turned out SO gorgeous, and we’ll always lovingly refer to this one as our longhorn wedding. If you know us, you know their longhorn altar was one of our all-time faves (we also included the Kingfisher cowhide, obviously). We loved their elegant white and green color palette, their timeless florals, and literally every detail! We can’t wait to share even more Kingfisher couples with y’all in the future! I’m thinking we need a second location in Kingfisher, or at least a Kingfisher Collection!